Celebrate all of your hard work! You are absolutely, positively, totally AWESOME! Of all the things you’ve learned this month — what habit or perception do you want to stick with you? Use that answer to empower a green candle dotted with pancake syrup — under a Taurus Moon — words, actions, and magickal operations tend to “stick” with you longer. Try to practice the manifestation exercise in yesterday’s post (28 December) three times a day. It is not the manifestation that is difficult — it is the belief that you can do it that’s hard. Today is the last day we will be together for the program this year — Wow! I can’t believe how quickly this month has flown by! It has been such a pleasure working with you this season. Thank you so much for your comments and hard work. I promise you that your efforts will pay off in unique and positive ways! On this last day let’s take one last walk through your environment with a pen and a piece of paper. Congratulate yourself on all you have accomplished and write down all the changes you’ve made. Bet you got more done than you thought you did! When you are finished, put this list on your altar. Next, bless a glass of water and “breathe” thoughts of joy into it. When you lose the thought, you are finished. Begin at your Joy altar, turn and carry this glass of water throughout your entire environment, sprinkling a bit here and there as you go. You can use a sprig of rosemary to dip in the water, a little broom, or you fingers to flick the water if you like. Intone the word “joy” as you walk and sprinkle the water. Be sure to sprinkle your Joy altar last. As you do, ask “Spirit” (what you believe runs the universe) to assist you as you perform your joy ritual. Hold a white candle in your hands, rubbing it briskly between your palms until the candle becomes warm with the friction. As you rub the candle, “breathe” thoughts of joy into the candle. Light the candle. Beginning at your Joy altar, turn and walk through your entire environment again, being sure to bring light into every corner and under things that are usually dark. Intone the word “joy” as you fill your environment with light. BELIEVE that the candle represents the light and spirit of pure joy — and it will be so. Have no doubt. Return to your joy altar and encircle the altar three times with the light. Place the candle on the altar and allow it to burn to completion. Return to the altar. Pick up and firmly hold the empty jar in your hands. We are now going to say what we are thankful or grateful for. This isn’t a list you’ve written down, this is one you will say aloud while holding the jar. Begin with something like: “I am grateful that I am alive. I am grateful for the universe and everything in it.” Continue with announcing everything you are truly thankful for — perhaps your job, your pet, your children, your partner, your talents — whatever…these are all the things that are “right” and “good” in your life. Nothing is too small be be thankful for. You can make the list as long as you like, and, honestly, the longer the better as the energy of joy grows in your heart and travels from your hands into the jar. When you are finished, take the list of goals and desires that I had you write out the other day and place them in the jar. Breathe into the jar, and say: “I breathe the joy of light and positive manifestation into these goals. (Say each goal aloud). I know they will come to pass. I have no doubt!” Breathe into the jar three times, then cap the jar tightly. This jar will remain in your environment until next year at this same time, or until the goals manifest. You can use the jar as a focal point for any magicks associated with the goals you have placed in the jar. When the goals have come to pass — all of them — open the jar, burn the list, and rinse the jar out with salt water (so that you can use it again); OR, you can break the jar and dispose of the pieces. Another option is to leave the jar intact until New Year’s Eve next year, when you can choose what type of ritual you would like to perform. You can leave the altar setup intact for as long as you like. You may wish to use your joy altar often, or you can dismantle it twenty-four hours after your ritual. Don’t forget, at midnight, when the laughter, noise, and bells ring in the new year to make a very special wish. The energy of manifestation of love and joy is highest on our planet at this time (so I believe). Let that energy carry your wish to the Gods…and beyond. Marvin (the raven) and I thank you for your participation in the Great Release Program this year. May your New Year be bright, may love always dance in your heart, and may wisdom ever hold your mind dear. The wisdom to make changes appropriate for yourself always lies within – you just have to acknowledge that it is there, and then remember to access it when you need it. Money Spell for drawing and keeping prosperity energy in your home — Roll real paper money dressed with attraction oil into a cylinder. Tie or tap so that the cylinder holds. Stuff cylinder with a small piece of paper containing your full name and money drawing herbs or powder. Blow on the cylinder 3 times, commanding that the herbs, the oil, paper and ink work together to attract money or good fortune to you. Tie the cylinder onto your candle holder. Dress a green candle with money or prosperity oil, and charge the candle for the same purpose. Burn the candle in a Venus or Sun hour. Hail and Welcome! 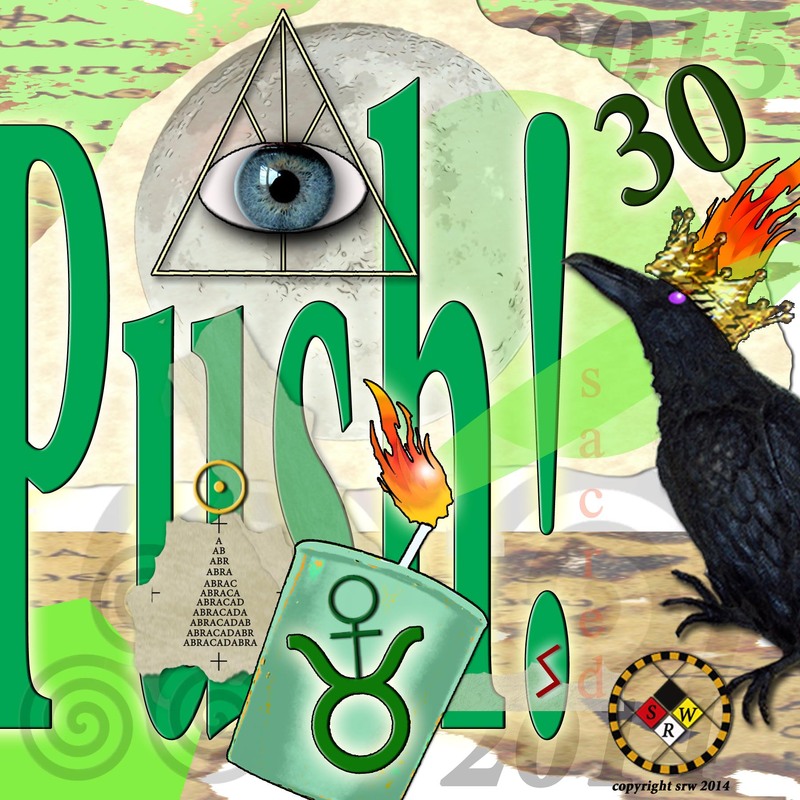 Today is BIG PUSH day! Today’s challenge is another “you choose” event! I am so proud of you and how you have managed to work through this program, stay relatively sane and juggle everything else this holiday season! You are amazing! The wonderful thing about this program is that it can change so many things in your life and you don’t realize it until the program is over. From giving you techniques to eliminate stress, to changing your buying, storage and daily living habits, to allowing you to directly experience how your environment impacts your mental and spiritual life — these changes will keep on pumping success energy throughout the year. And…that’s not all! Th Great Release Program proves that YOU are the power — the driving force — the Master or Mistress of your Life! Tomorrow is the last day of the program. Can you believe it? Wow! It certainly went by fast! Did you know that this program is not pre-written? Nor is the artwork pre-designed? That’s right. I get up every day, do my Morning Braucherei ritual, bless and empower the water offering, turn on the computer, have a cup of coffee, read your comments, and then write the next day’s program entry. In this way, the material is timely, fresh, and inventive! As this was the fifth year, it was easier to write the guidelines, particularly because for the last five years you have been so kind to comment. Your comments tell me where the program can be improved, or changed to better meet your needs. Thank you so much! Once the day’s entry is written, I turn to the artwork. Every year I try to do something different. 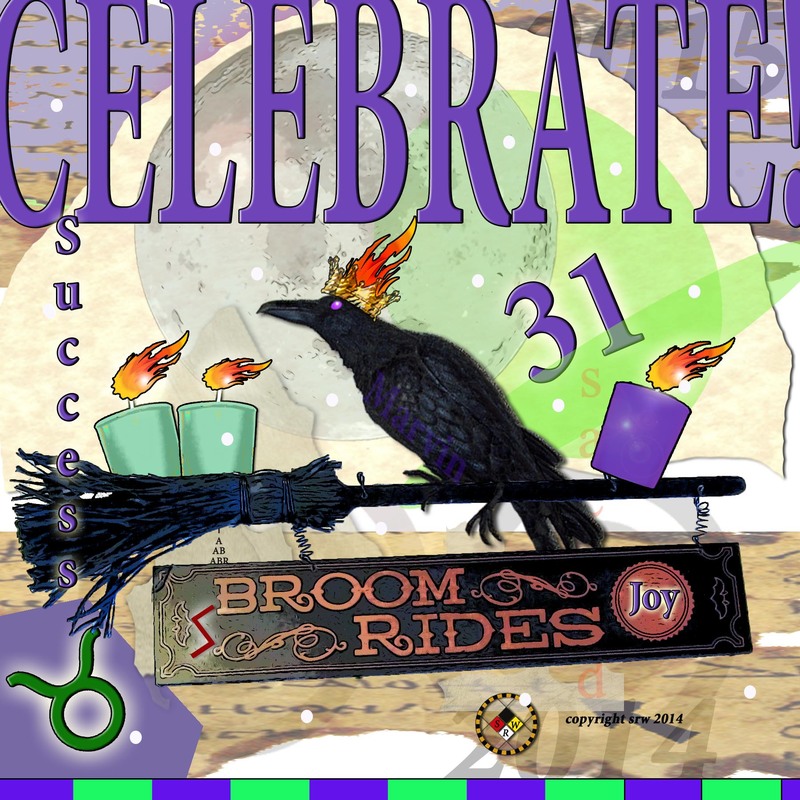 This year’s star element was the crowned raven — he is wearing that kingly headdress to bring you super success the whole year through. His name, by the way, is Marvin. Feel free to keep Marvin with you the whole year through! Today’s Challenge! Big Push Day! The Moon is in Taurus 2nd quarter — the building time. What is done in a Taurus Moon — stays done for quite a while! Taurus has marvelous staying power! Take a walk through your environment and marvel at all you have changed! Congratulate yourself! I know you are seeing things that you didn’t get to, and are already planning to do a few of these things in January. Today, choose one thing that you believe will have the most impact in changing your life for the better. You now know how things in your environment can affect your living experience. With this in mind, pick something to change today that you know will have a lasting impact for the better. The second part of today’s challenge is to finish preparing your Joy altar (if you haven’t already) for our December 31st ritual. This ritual is our program closer, signifying all the hard work you have done, celebrating all the changes you have made, and encouraging bright, positive energies into your environment for the new year. This space can have anything on it you desire, as long as every object is somehow tied to your work on the program and encourages the manifestation of your goals. You choose the colors, the props, and the goals — this way your ritual will be tailor made for you. Finish setting up this space today. Cleanse and bless everything you’ve placed on the altar. COVER the altar until tomorrow. Don’t forget your will need one empty jar (from fancy to canning — doesn’t matter). Summary — Here are today’s activities! Total Number of Stars You Can Earn Today: 34 – another SUPER star day!